When Nissan wanted inspiration for its all-new Maxima, it knew one place to go: the Blue Angels’ Naval Air Station in Florida. Plenty of cars have named fighter jets as their muse through the years, but Nissan took it a step further by looking at where some of the most prestigious pilots in the world spend their working hours. The result? The Maxima’s interior is one of the best on the market, and that includes cars from luxury brands like Lexus and BMW. Nissan’s interior designers really hit it out of the park. Not only does it get the obvious stuff right — putting all the controls within easy reach — but it adds some fighter-jet drama by angling the entire center stack toward the driver and lifting up the console higher than in most cars. You don’t sit in the new Maxima so much as you let the car wrap around you like a cocoon. It’s a cool feeling. 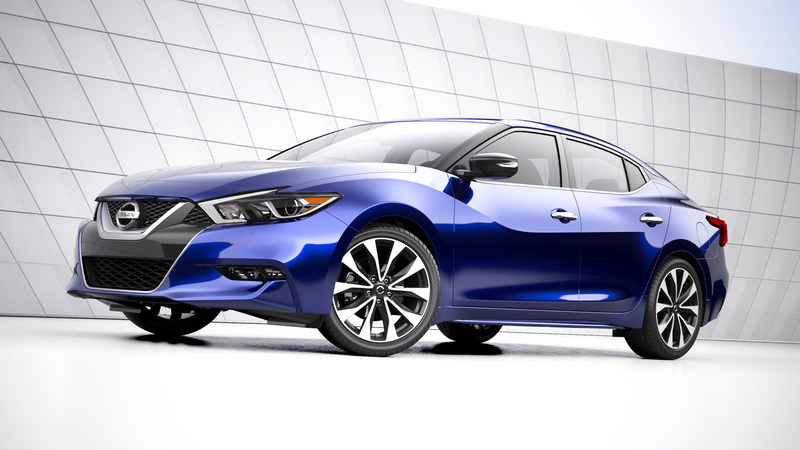 New for 2016, the Nissan Maxima sports a fresh look that makes it stand out on the road. Its body is bolder and more inventive than most four-door cars. Still, it’s faster and more fun than most four-door cars are. It has a solid, almost German driving feel to it, taking a much more heavy-handed approach to its sports-car ambitions than, say, Mazda does with its light, nimble feeling Mazda6. Power from the Maxima’s 300-horsepower V6 feels spectacular despite being shoved through a continuously variable transmission (CVT), which I would normally consider a mortal sin in a sporty car. Nissan, though, seems to be making better CVTs with each new car it introduces, and that’s certainly the case with this one. While its first efforts a few years ago felt strange and rubber-band-like, this all-new transmission does a great job mimicking the feel of a traditional automatic — even faking “shift points” when you really nail the accelerator. Its fast response makes it my favorite Nissan CVT to date. A specially tuned sport suspension on the SR version ($37,670) does a good job flattening out the car in corners without making it too harsh on the highway. Enthusiasts might prefer firmer shocks and springs, but I think this is a sport package I could live with every day. The Maxima’s cabin is spectacular, especially in the upscale Platinum trim level. My favorite trim, though, isn’t the sporty one. It’s the fancy Platinum level ($39,860), which was created when a FedEx driver made a mistake by accidentally delivering Rolls-Royce’s leather to the Nissan factory. At least, that’s how I imagine it. The diamond quilted seats just seem way too sumptuous to belong in a $40,000 car, but kudos to Nissan for getting it done. Pricing starts at $32,410 for the 2016 Maxima, which is about $10,000 more than the starting point for Nissan’s smaller, less luxurious Altima sedan. It has the premium feel and performance you would expect from a luxury brand. It’s totally new, inside and out, with aggressive body styling and one of the best interiors available in any car today.